Love that first dress on you! So pretty! I'm a hoarder too, I own so many dresses but only wear the same 5 or 6! Yes! I do the same, I rotate through my favourites! It's been good to give them all a chance to get worn instead of just favouring a few. Both beautiful dresses! I love the unique patterns on each of them. That necklace with the first one is stunning! You look lovely. I don't have many dresses, so I probably would have failed miserably at Frocktober, lol. Again, congrats for all the money you raised! Very cool. Love that printed dress! You look great in each! Oh my goodness!! I definitely know why you're playing catch up! So many dresses and so little time! Love that maxi dress - I have a similar print maxi in black/green. They are so comfy but the pattern makes dresses it up a notch. What a wonderful fundraiser you participated in Mica! And no wonder you were missing the jeans. I am a lover of dresses but do wear lots of jeans with Little M, especially at the park/playground! Yes I did miss the jeans especially wearing some of my shorter dresses, not ideal with a toddler! I tried to wear them on days I was working to make it easier! fantastic hand bag! very cute dresses! You look so lovely! Both look great on you and both of them are blue ♥ That bag though, really goes with anything. Yep, I definitely tend to cycle through a few favourites and neglect the rest, its' a shame :( Means I have too many things, haha! I'm petite and I love maxi dresses! Although most of the time I do have to get them hemmed, yes, haha! I like the tiye dye dress! You don't see that around so much anymore. You look great! Both dresses are lovely on you. Also your Balenciaga bag is such a lovely versatile piece! Ooh I love both dresses! The print on the second one is fabulous! Both look nice on you Mica. The first gives you room to move and play! Great choice! Love the print of the second one. Sorry to hear about the orange one. Each baby is different. Definitely! And the baby and bump are very different this time around, haha! I wouldn't have gotten rid of any of your dresses either! You've looked so cute in all of them! Really love the paisley print, glad you got one more wear out of it this season! love love love the first outfit, that dress is gorgeous! Wow, you DO have a TON of dresses! haha. 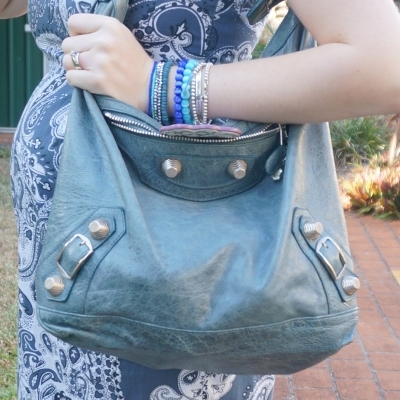 Even with a baby bump this challenge was so easy for you. Not to mention a great way to weed out those dresses that don't suit your tastes anymore. (; LOVE that French Connection dress! It was really tricky finding dresses to fit near the end, no matter how easy it looks on the blog, haha! I wish I could have gotten rid of a few more dresses, but I liked them all really! Fellow dress hoarder here! haha. I have so many maxi dresses, it's time to purge and donate. 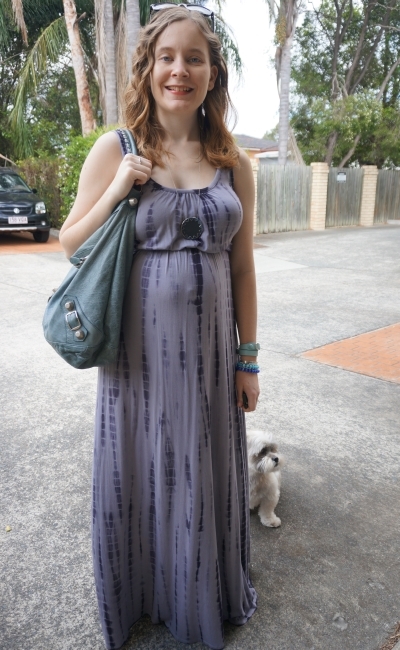 Your blue maxi is DREAMY and I love that it works as a maternity dress as well. You're such a cute momma-to-be! I've said this before, but your dress collection is so impressive! Especially since you have a growing bump to consider. These are both great ones, I love the blues! 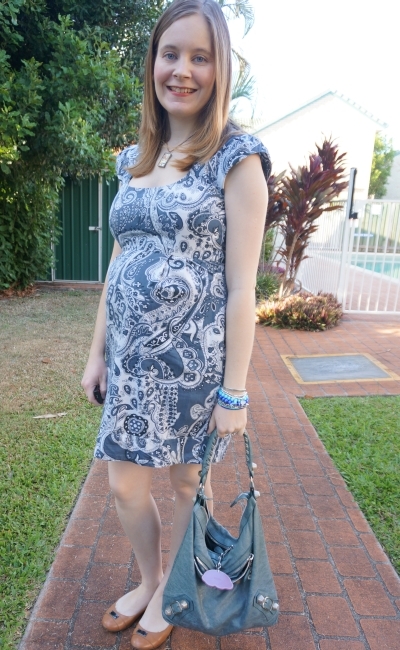 I'm pleasantly surprised I've been able to squeeze the bump into so many dresses, haha! I saw your picture via Instagram of that beautiful blue dress. You look lovely here Mica, it fits you and the baby beautifully. Thanks Lorena. I'm glad I decided to keep that printed dress a little longer, after it was a 'maybe' in the wardrobe detox!